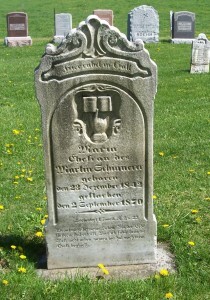 Translation: Here rests in God, Maria, wife of Martin Schinnerer, born the 23 December 1842, died the 2 September 1870. Maria Schinnerer was born Maria Schumm, the second child of Ludwig and Barbara (Pflüger) Schumm. Her birth predates the Schumm church records, which begin in 1846. However, both her marriage and her death are recorded in the church records. Maria married Martin Schinnerer on 23 February 1860. According to the church records “Anna Maria” Schinnerer died 1 September 1870 at the age of 27 years, 8 months, and 4 days. She was buried on the 2nd. This date disagrees with the death date on her tombstone by one day. It appears that Maria (Schumm) Schinnerer may have died as a result of complications of childbirth. She died a day or two after the death of her last child, who was only 14 days old. A tombstone does not appear to exist for that child, Johann Ludwig, who died 31 August 1870. 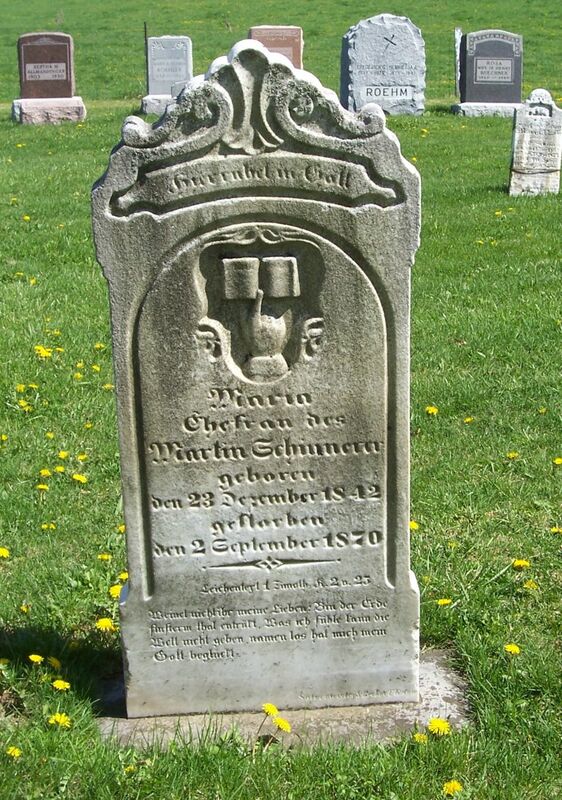 Maria’s husband Martin Schinnerer was born in Bavaria in 1834 and came to America in 1852. He was the brother of my great-great-grandfather Friederick Schinnerer. After Maria’s death Martin married her sister Rosina. They were married in a civil ceremony by Thomas Cully, JP, on 2 March 1871. According to one source, Martin’s second marriage was not allowed at the church so they were married by a Justice of the Peace. Their marriage was not recorded in the Zion Schumm’s records. Martin and Rosina moved to California around the turn of the century and remained there the rest of their lives. Martin died in Los Angeles in 1930 at the age of 96. The inscription on Maria’s tombstone is a little unusual because it shows her birth and death dates, instead of only showing her death date and age. You usually have to calculate the date of birth from a tombstone inscription of this era. According to her tombstone inscription her age would have been 27 years, 8 months, and 10 days, which is six days off from the church record. Perhaps math wasn’t the minister’s best subject or the tombstone was carved incorrectly. “Ohio, County Marriages, 1789-1994,” index and images, FamilySearch (https://familysearch.org/pal:MM9.1.1/XD24-GG4 : accessed 26 Jan 2014), Martin Schenerer and Rosana Schumm, 2 March 1871; citing Van Wert, Ohio, United States, reference 568; FHL microfilm 1015860. Conversation with Mildred (Schumm) Franz (Mrs. Christian Franz; Decatur, Indiana, 46733), by Karen Miller Bennett, May 1999. Mrs. Franz is now deceased. Interesting, there was a Kenneth Schinnerer in my class at Willshire. Or was it just Schinner? Have not kept track of Kenny, but this leads me to wonder if perhaps he was not also a distant family relative. In fact, it seems highly likely that most of the folks living in the area when we were young were probably relatives to some small degree or another either directly or by marriage. Guess that is what happens when most folks marry someone within 3 miles, and most of those folks traveled from Wurttemburg or nearby (common history, language and family contacts). The Kenneth Schinnerer you knew was the son of Arthur Henry and Helen (Spring) Schinnerer. He was born in 1950 and passed away in 2007. The year of birth would have been correct as most in that class were ’49 or ’50. Did not know of his passing. Guess I should have looked more closely at the list at the last class reunion. Probably just did not stick in my memory as so many things seem to be fleeting there anymore. Thank you for the effort and information. Did not intend to put you to the test, but am impressed with your success. Martin and Maria Schumm Schinnerer are my great-great-grandparents. Their son, Johann, known as John, was my great-grandfather. Thank you for uncovering the part of family history about Martin. John’s wife, Anna Evers, emigrated from Germany in her late teens and they met in the USA. My mother spoke fondly of him – Anna and John had lived next door to my grandparents in Detroit while my mother grew up. John was a pastor in the Lutheran Church -Missouri Synod, pastoring congregations mostly in Michigan. They are buried in Glen Eden Cemetery in Detroit. Thank you for the information! We need to share information sometime. I will be in touch. Where did your great grandmother die? Findagrave has Orange Co.,CA & John dying in Detroit (is that correct?) Also findagrave has Anna born in Jul not Jan as I had. Which is correct? Oh & Glen Eden Memorial Park is in Livonia not Detroit.